In NMRlipids I and II projects, the goal was to find a MD model that would correctly reproduce NMR data (for lipid headgroup & glycerol backbone structures, and for cation binding) in PC bilayers. In NMRlipids IV project, we set the same goal for PE, PG and PS lipids in bilayers (pure or mixed with PC). The standard NMRlipids workflow and rules will be applied. The current version of the manuscript is available in the GitHub repository. Currently, the manuscript is mainly a collection of relevant experimental data. For example, Fig. 1 compares the experimental headgroup and glycerol backbone order parameters between PC, PE, PG and PS lipids. backbone with different headgroups from experiments. For references and other details see the manuscript. The conclusion based on this, together with some additional data, has been that the headgroup structures are similar for PC, PE and PG lipids, while PS headgroup is more rigid [Wohlgemuth et al, Buldt et al.]. On the other hand, the glycerol backbone structure has been considered to be similar in model systems and cells for all these lipids [Gally et al.]. Some preliminary comparison between experiments and simulations with CHARMM GUI parameters are shown in Figs. 2 and 3, suggesting that the model has some difficulties to reproduce the experimental order parameters for PS and PG headgroups. More detailed conclusions are difficult to draw only from these data, because experimentally the signs of order parameters for PS and PG are not available (as far as I know). However, the results from other models might help to draw some connections between order parameters and structural details, as was done in NMRlipids I for PC lipids. from simulations and experiments. For references and details see the manuscript. Absolute values are shown, because signs are not known for experimental data. Experimental data on cation binding in PC bilayers mixed with of negatively charged PG and PS lipids is shown in Fig. 6. As expected, adding CaCl2 causes a stronger decrease in the PC headgroup order parameters when the amount of negatively charged lipids is increased. According to the NMR electrometer concept (see NMRlipids II for discussion), this means that the amount of bound Ca2+ increases when negatively charged lipids are present in bilayers. Fig. 6 Changes in the PC headgroup order parameter as a function of CaCl2 concentration in bilayers containing various amounts of negatively charged lipids. For references and details see the manuscript. (iv) the actual binding step can be described by a Langmuir adsorption isotherm with a 1_lipid_:_1_Ca2+ stoichiometry, provided the interfacial concentration CM is used to describe the chemical binding equilibrium." I believe that an MD simulation model correctly reproducing the cation binding in negatively charged lipids could further sharpen this interpretation. The goal of this project will be to test if currently available models can be used for an such interpretation. This should also help the model development (if needed), however the actual improvement of force fields is beyond the scope of NMRlipids IV. Results from different simulation models. Simulations of bilayers containing PE, PG or PS almost under any conditions would be currently useful to map the behavior of different models. Direct delivery of calculated order parameters through GitHub or blog comments, or by making the simulation trajectories accessible (for example, through Zenodo) would be ideal ways of contributing. Order parameter signs for PE, PG and PS. The order parameter signs are very important for the structural interpretation. However, I am not aware of the order parameter sign measurements for other than PC lipids. If such data would be somehow available, this would be highly useful contribution. I have lots of pure POPS and DOPS simulations that you can use. There are 4/5 force fields (Berger, 2 closely related GROMOS ones, CHARMM36 and Slipids) with repeat simulations and several different commonly used cut-off schemes for these different force fields. All simulations are 500 ns using GROMACS 5.0.6 and have been simulated from the same starting structure. The membranes have 128 lipids and the systems just have neutralising Na+ ions. I am busy with several things at my main work, plus I am also trying to finish off a paper at the moment (in fact also related to order parameter calculations; I will share more on this when I can) but when I get the chance I will calculate all of the order parameters for these POPS/DOPS simulations and share them. I also should have some PE and PG simulations too with a few different force fields (definitely with some GROMOS ff's, probably also some CHARMM36). I will look out what I have on these from my archived data. Again, these will probably just have neutralising Na+ ions (for PG) or no ions at all (for PE). Are the mentioned GROMOS related parameters the ones which can be found also from Lipidbook? The GROMOS PS parameters aren't yet on Lipidbook but follow the same strategy as the rest of the GROMOS-CKP lipids (the larger vdW radii for the carbonyl carbons as per the Chandrasekhar and Kukol approaches with the rest of the parameters as standard GROMOS). There are, in fact, two slightly different parameter sets for PE and PS. Ones with the same charges as those used in the Berger PE/PS lipids and ones with standard GROMOS charges for the NH3 groups (as taken from a lysine side-chain). For PE, I also believe I have simulations with GROMOS 43A1-S3, standard Berger plus some Berger sims with modifications to include some repulsive LJ interactions of the NH3 hydrogens, OPLS-UA (with the same types of modifications as per some of the Berger sims) and maybe some others too. The GROMOS PG simulations I have will be with the GROMOS-CKP parameters already on Lipidbook. I should hopefully be able to find everything soon related to PE/PG in my old files. I already have all the PS simulations to hand and will try and run the analysis asap for these. By the way, which would be the main reference for the GROMOS-CKP parametrization strategy? The original approach was proposed for DPPC by Chandrasekhar et al. (the C in the CKP; http://link.springer.com/article/10.1007/s00249-002-0269-4) where the increase to the van der Waals radii for the ester carbonly carbon was first used. Kukol (the K in CKP) took this approach further by applying it to other PC and PG membranes (http://pubs.acs.org/doi/abs/10.1021/ct8003468). However, upon testing I found that there were several problems with the Kukol parameters (so with everything apart from DPPC IIRC). In particular the problems were with (i) the bonded parameters in the head group plus glycerol regions and (ii) the use of the Bachar double bond dihedrals which gave really bad order parameters (although these dihedrals do work well for Berger POPC). These problems are discussed briefly by myself (the P of CKP) in the SI of http://pubs.acs.org/doi/abs/10.1021/jp207013v and are discussed in more detail in http://pubs.acs.org/doi/abs/10.1021/ct3003157. So, unfortunately a bit of a mess in terms of referencing. I guess for general parameterisation strategy there should be a reference to the work of Chandrasekhar et al. and probably the first of my two papers (the first one doesn't mention the name GROMOS-CKP explicitly but does show the approach working well for PE, PG and Cardiolipin membranes; the second shows the approach working properly for POPC and demonstrates the problems with the Kukol POPC parameters). I forgot CHARMM36-UA POPS/DOPS simulations too! So slowly processing through head group PS order parameters. Could you report also the amount of water molecules in the systems? We are planning the experiments to measure the signs and it would be convenient to use the same amount of water. Sorry for the slow reply, I hadn't seen this until now. There are 35 waters per lipid in all the systems (so 4480 waters). Analysis of the other force fields is in progress. I'll report these when completed. Do the temperatures for POPS (298K) and DOPS (303K) apply also to Slipids and CHARMM36-UA simulations? PE figure is yet to be done. It seems that the results by Fernando Favela and Thomas Piggot for DOPS are in good agreement. On the other hand, it seems that PS results are in good agreement with experiments for headgroup (as mentioned in the comment below), but PG results are not that good. Alpha order parameter is too low, but beta shows apparent agreement with experiments. However, only absolute values are compared, because signs are not known experimentally. The sign of beta order parameter is positive in these simulations, in contrast to PC where negative sign was measured. Thus, the the beta order parameter agrees with experiment with the assumption that its sign is opposite than for PC. I start to feel like that the signs measurements are almost necessary for more solid conclusions. The results for alpha and beta carbons seems to be pretty close to experiments from all simulation models, assuming that the signs of both alpha and beta carbon order parameters are negative. Slipids has problems in glycerol backbone region, as already observed for PC lipids in NMRlipids I.
I think that it is remarkable that simulations succeed to reproduce the differences in order parameters between PC and PS headgroups (assuming that the signs are correct in simulations). This means that we could use simulations to interpret the structural differences between these two lipids. I will analyze the data by Fernando Favela soon. Above comment states "I think that it is remarkable that simulations succeed to reproduce the differences in order parameters between PC and PS headgroups (assuming that the signs are correct in simulations). This means that we could use simulations to interpret the structural differences between these two lipids." We have now the signs from PS from experiments, but these do not agree with the Slipids and CHARMM simulations for alpha carbon (simulations give negative, experiments give positive for larger value from alpha carbon). Unfortunately this means that these simulations do no seem accurate enough to interpret the experiments. I've finally got around to analysing all the united-atom POPS and DOPS simulations. Exactly the same as the ones I've already reported above, so the analysis was performed over the final 100 ns of 500 ns simulations. These simulations used the same starting structures as the all-atom ones, with hydrogens removed as needed and again only have sodium counter ions. Are these still the same system as previous (same amount of lipids, water, etc)? Yes, all the POPS and DOPS structures are the same across force field. The initial membrane was made with the CHARMM-GUI and converted into the correct format for the other force fields. Thanks again for Thomas Piggot for the extensive data set. I added the DOPS results in Fig. 2. (https://github.com/NMRLipids/NMRlipidsIVotherHGs/blob/master/Figs/HGorderparametersPOPS-eps-converted-to.pdf). It seems that the "Berger" model is quite a bit off, as already anticipated by Thomas above. CKP models are closer, but maybe not within experimental errors (CKP1 refers to the first and CKP2 to the one with NH3 parameters from lysine side chain). It should be noted, however, that this and above dicussion is based on the assumption that signs of order parameters are correct in CHARMM and Slipids. If it turns out experimentally that this is not true, this must be reconsidered. POPS results are yet to be added. After digesting this data for a while, I think that we must get the signs of the headgroup order parameters measured also for PE, PS and PG to make any solid conclusions. I will try to get this organized. It seems currently very promising and I hope that we have the signs within few months. 0.09 and -0.02 for alpha carbon. This means that the signs in Slipids and CHARMM simulations for alpha carbon of PS (simulations give negative, experiments give positive for larger value from alpha carbon) do not agree with experiments. For g3 the resolution was too low to get a proper estimate. I have included these values in plots in manuscripts. I have (yet unanalyzed) simulations for PC/PG head group mixtures that I can contribute. Simulations are with 500 lipids in mixing rations PC:PG of 1:1 and 4:1, simulated for 200 ns each using the CHARMM36 FF, with 1M/0.15M calcium chloride or neutral (only potassium counter ions). Sure, I can arrange for the raw files to be uploaded and meanwhile I can use the bash wrapper to get the order parameters. I could, however, not find the python script that the wrapper points to ($scriptdir/calcOrderParameters.py). If you can direct me toward that script, I can get on it. how did you determine the concentrations in these systems? Could you deliver the number of water, ion and lipid molecules in the systems? The reported concentrations are inputted to the CHARMM-GUI in constructing the systems and therefore *not* estimates of experimentally measurable bulk salinity. I am away for this week and can return with specification of component numbers upon my return. I did not run the system 4:1 system with 0.15MCaCl2. I plotted this data with experimental data. The decrease of alpha-order parameter is in agreement with experiments, while decrease of beta order parameter is overestimated. The result is very similar to the results with CHARMM36 PC in NMRlipids II publication. The conclusion in there was that the Ca2+ binding is too strong in CHARMM36 model despite of the seemingly good agreement of alpha carbon with experiments. The reasoning was that the dependence of alpha-carbon order parameter on bound charge is too weak in CHARMM36, while beta-carbon is more realistic (see Fig. 3 in NMRlipids II publication). However, this was not explicitly tested against experimental data. I have now done some tests like this for Lipid14 model, which I am planning to report soon. After seeing these results, it seems that these tests would be useful for CHARMM36 as well. It should be also noted that the beta-order parameters are not actually measured for PG. The experimental line in the figure is calculated from empirical relation \Delta S_beta = 0.43\Delta S_alpha. Thus, my preliminary conclusion from the data would be that the Ca2+ binding is similarly (not more or less seriously) overestimated in CHARMM36 simulations with PG than in simulations with only PC. and POPG. In addition, absolute value in systems with CaCl_2 is in agreement with experiments. However, system with 4:1 mixture of POPC and POPG behaves differently, but experimental data is not available for direct comparison for this mixture. In conclusion, the qualitative response of PG on CaCl_2 seems to agree with experiments. However, the difference between 1:1 and 4:1 mixtures is mysterious. Ion and lipid density profiles would be also useful from these simulations. Also simulation data of ion binding on PG with other models and of ion binding on PS bilayers with any model would be highly useful at this point. 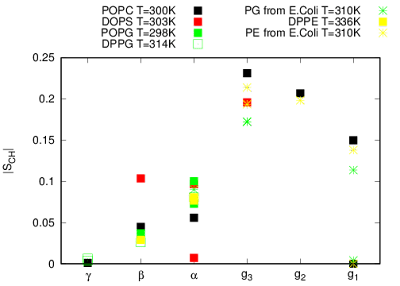 The density profiles suggest what you would expect: that calcium ions bind tighter to the more negatively charged 1:1 PC/PG membrane surface as compared with the 4:1 PC/PG membrane. I have uploaded the trajectories of POPC/POPS (4:1) with 1M NaCl, KCl, CsCl in Berger for lipids and and Dang/gmx for ions. Would you also have the trajectory with only counterions? That would be needed for the reference when using electrometer concept. I will run the counterions-only systems. This can be compared to the reported simulation data as soon as we get the simulation with counterions only. Evidently, some isomers are absent in Slipids, which might explain its order parameters in Botan et al. All of the isomers are present in CHARMM36, as discussed in Klauda et al., 2010. 1) There are significant differences between CHARMM36 and Slipids. Perhaps it is better to use CHARMM simulations for headgroup comparisons. 2) For PS and PC in Slipids trajectories, there are also large differences in some of the not-glycerol dihedrals (dihed8, 9, 10). Consequently, order parameters for respective hydrogens (at C11 and C12) might also be different. I find your visualization for the glycerol structures very useful. I did already include it in the current version of the manuscript, but we need to find a proper place for this discussion when the manuscript is closer to its final shape. How did you selected the structures shown in the figure? The dihedral comparison is also very useful. I am slightly troubled with the observation that the differences between slipids and CHARMM seems generally larger (with some examples as mentioned) than the differences between PC and PS. I have just uploaded the experimental information about signs of POPS headgroup and neither of the force fields do not succeed very well in the comparison. We need some careful thinking now how we should compile these results. Do you have some script to calculate these dihedral angles? It might be useful to run it also for other simulations as well. I am in (slow) process of collecting all the reported data in the table with links to raw data in Zenodo. 1. The structures were selected as following: first the trajectories of individual lipids were concatenated into a single trajectory. Then all frames were aligned to the first one using the glycerol atoms C1-C2-C3-O21. Then 512 frames were selected evenly throughout the trajectory. 2. Regarding the scripts, currently it is a VMD tcl script to calculate angles and a Mathematica script to draw the distributions. We can try to rewrite the scripts with python and then share them, or we can process the other trajectories ourselves (in this case, please share the list of the trajectories of interest). Finally, we will share our trajectories with Zenodo soon. CHARMM36 DOPS gives quite similar order parameters as Slipids DOPS. CKP models are better for alpha carbon but not for the beta. Comparing dihedrals between these models we might learn something. I would also include the dihedral for the bond between beta carbon and carbonyl of PS headgroup in the analysis to see differences between CHARMM, Slipids and CKP for this. As mentioned, the data for all the proposed analyses is delivered by Tom Piggot but the trajectories are not (yet) in Zenodo. Would it be possible to upload them or to organize the analysis in some other way? I also think that we should choose which one of the switch version we use for CHARMM and if we use RF or PME data for CKP. To perform all the analyses for all of these options gets a little bit too complicated. I'll get the CHARMM36 and GROMOS-CKP simulations reduced in size (the frames are every 5 ps in the original trajectories meaning these files are about 7-12 GB) and uploaded to Zenodo asap. With CKP I will just upload the PME simulations. The RF ones are actually being re-run at the moment with slightly different settings and even though I don't think this will change the results much, the PME ones should be used for now. As for CHARMM36, I guess we've had this discussion elsewhere (https://github.com/NMRLipids/NmrLipidsCholXray/issues/4). I'm happy with picking either as there are arguments that can be made for both and the results are very similar. Perhaps the switching point at 10A? In my understanding most people nowadays would use CHARMM36 with switching point 10Å due to CHARMM GUI and Gromacs instructions, so maybe this would be better choice now (although I understand your arguments for 8Å as well). The trajectories have been reduced to have a frame every 50 ps and only include the final 100 ns of 500 ns simulations. It's worth stressing that the order parameter data provided above was calculated over the same simulation time but was performed on the original trajectories, so with a frame every 5 ps. If anyone needs either the longer trajectories or ones with more frames just let me know. The trajectories I've uploaded are for the final 100 ns of the 500 ns simulations, with the original trajectories also reduced in size to now have one frame every 50 ps (rather than every 5 ps, as analysed in the data provided above). I've also only uploaded one representative simulation setting for each POPS and DOPS force field I simulated (e.g. the 10 Å switching point for the CHARMM simulations) to make things easier. As the data above shows, there is relatively little impact of these settings upon the calculated order parameters. If anyone wants the longer trajectories, more frequent frames, or some of the simulations with other settings please let me know. Thanks a lot for sharing the data! I have now updated the Table I in the current manuscript to contain the links to the data (https://github.com/NMRLipids/NMRlipidsIVotherHGs/blob/master/Manuscript/manuscriptPS.pdf). It seems to me now that it would be best to run the above dihedral analysis to the delivered POPS systems listed in the table. For POPS we have the widest collection of different models and experimental data points. The links to the data of all delivered POPS systems are now in the table I in the manuscript, thus such analysis should be doable now. The correct references for CHARMM36, CHARMM36ua, GROMOS-CKP and Berger POPS are yet to added in the table. If someone has these at hand, it would be useful to fill them or deliver here. Finally, we have performed the analysis for all the POPS systems available. For the glycerol conformations, the differences between different force fields could be clearly visualized again. Interestingly, for Berger force field the improper C1-C2-O21-C3 is very flexible. Also, there are quite noticeable differences between CHARMM36 and CHARMM36UA, though the isomer parametrization is the same for both force fields. Dihedral angle distributions show significant differences between force fields. Slipids and CHARMM36 force fields result in quite similar distributions, though still there are some differences. The other force fields differ from each other and from CHARMM36 and Slipids on a greater scale. The dihedral distributions are somewhat imperfect. Thomas, if it is possible, could you please share with me your trajectories with more frequent output, to make all the distributions smoother? Thank you in advance. I think that the dihedral distributions are smooth enough for our purposes, at least for now. After a couple of quick looks, I cannot see any clear correlation between dihedral distributions and order parameters. I would be happy to hear any ideas how we could say which one of the distributions are more realistic. How about the last dihedral of the headgroup, i.e., C12-C13 in CHARMM notation? It would be highly interesting, but I do not see a figure for it. Would it be possible to analyze this Amber produced data with your script? As for Amber Lipid 17 trajectories, we can analyze them, but I couldn't find any structure file, psf of pdb, which I need for the analysis. Could you please add them? Then we will calculate the distributions. Regarding the correlation between dihedral distributions and order parameters, Jeffery Klauda with colleagues discussed it in the original CHARMM36 paper (second paragraph in Section 3.2, pubs.acs.org/doi/pdf/10.1021/jp101759q). They calculated S_cd for different dihedral states and then tried to predict optimal populations of different conformers. Perhaps the same could be done here. Since I don't have the data for the other ff's, I only calculated the raw angles and did not plot them. If you want to recheck the calculations using your script, I can upload a pdb file to zenodo for Amber trajectories. I've uploaded the pdb file for DOPS with Amber Lipid17 simulations to: https://zenodo.org/record/1173625#.WoWksGaZMWo. And the PDB of POPS with ff99 ions can be found in here. After focusing only to the headgroup (not glycerol backbone) part of the dihedral distributions (Fig. 16 in the current manuscript), I came up with this possible idea. The main differences between the models in the headgroup region are observed for dihedrals C12-C11-O12-P and C11-C12-C13-O1A. 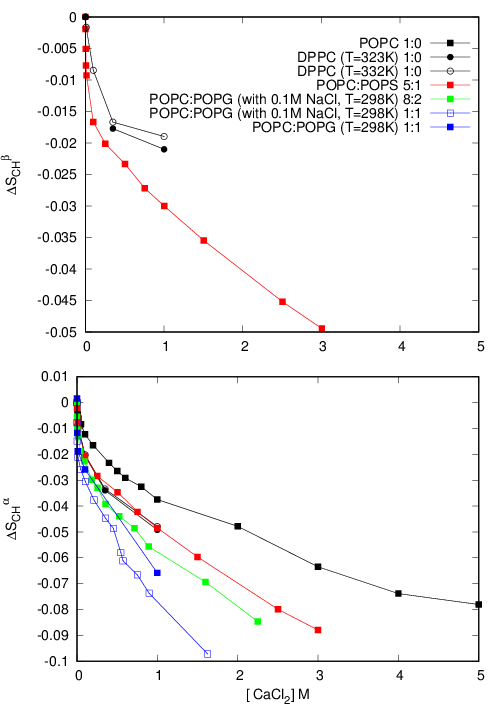 The distributions from CHARMM36, CHARMM36UA and Slipids for the latter dihedral C11-C12-C13-O1A are similar, all having only a single peak around 120 degrees. This dihedral is close to the beta-carbon and its order parameter is best reproduced by the CHARMM36, CHARMM36UA and Slipids models. On the other hand, Gromos-CKP models give better order parameters for the alpha-carbon. Distribution of C12-C11-O12-P dihedral close to alpha carbon gives a single peak around 180 degrees in these models. In conclusion, the suggestion would be that CHARMM models and Slipids give more realistic distribution for C11-C12-C13-O1A dihedral (single peak around 120 degrees), while CKP models would be more realistic for C12-C11-O12-P dihedral distribution (single peak around 180 degrees). To see if this idea would be also in line with Lipid17 results, it would be useful to get the results included in the plot. Now the results from MacRog are added to the Fig. 5 and they seem to be pretty good for the alpha carbon. Therefore the better option for C12-C11-O12-P dihedral could be the distribution from MacRog peaking at around 100 and 240 degrees. In the Lipid17 trajectory with jcions (https://zenodo.org/record/1148495) the head groups look almost frozen - should it be like that? Amélie Bacle and I have simulated some PC/PE mixtures at different ratios (POPC/DOPE and DOPC/DOPE at 100:0, 75:25, 50:50) using Berger FF (as implemented by Luca Monticelli, i.e. compatible with OPLS-AA proteins, http://perso.ibcp.fr/luca.monticelli/lipids/index.html) at 300 K, 300 ns each. If it can be of interest to NMRlipidsIV, we would be happy to share the trajectories and calculate the order parameter of the polar head protons. Thanks. I think that at least the PE order parameters calculated from the highest mole fraction would be useful to get an idea how this model performs for PE. Possibly also the effect of PE on PC order parameters might be interesting for the project. There is, however, no (as far as I can remember) experimental data for PC/PE mixtures so this cannot be directly compared. It might be useful for general understanding, thought. FYI PE membranes simulated with the typical Berger PE ff (so with just the methyl groups in the PC choline switched for standard hydrogen atom parameters) in general won't behave well. The hydrogens in the ethanolamine group form exceptionally long-lived hydrogen bonds with the phosphate oxygens generating ring-like structures in the head group. This is a general issue that also arises with PG and PS 'Berger' lipid parameters. The APL of pure PE memembranes simulated using these parameters is also far too low. There are references for this (let me know if you wan't them? ), plus I've simulated these in the past and can confirm these issues. You can get around some of the issue by adding a repulsive potential onto the ethanolamine hydrogens. However, AFAIK, the only published version of this fix is for DOPE (http://pubs.acs.org/doi/abs/10.1021/jp0366926). When I tried it with POPE, I had to slightly increase the repulsive potential to get good overall membrane properties (IIRC, this was done ages ago but I should still have the files somewhere, if anyone is interested?). Amélie has calculated the order parameter but I want to check something about the sign. So we'll come back soon with the values. @Thomas: thanks for the pointers. I think it's still interesting to see how "untouched" Berger lipids behave for a systematic comparison (like in NMRlipids I). And then maybe try the fix you're talking about and see what happens on the order parameter. About using APL for validating pure PE simulations, this can be problematic when the lipids are not forming a lamellar phase, such as pure DOPE (which is in the H_II phase at room temperature). And this is the only PE we used in our simulations. I haven't dig too deeply into literature, it looks like there are a few NMR studies on DOPC/DOPE mixtures (using 31P & 2H), but I don't know yet if they are usable for validation. Still, I'm interested in the refs you're talking about, I guess the simulations were done on lipids forming a lamellar phase at room T.
The sign information has been now updated in the manuscript, see also the comment below. I would be also interested about the references for 31P and 2H experiments of DOPC/DOPE mixtures. Sorry for my long silence, but now Amélie and I could check the sign. --> I'm quite surprised about the massive effect on g2 on going pure DOPC to DOPC/DOPE 50:50. Not easy to compare these results to the ones reported in the manuscript for DPPE as when we have PE, it's always a mixture with PC. Also I recall, DOPE is non-lamellar at room T.
With Amélie, we plan to give a try to the fix Thomas mentionned about (putting a slight repulsion on choline H). We'll report back in a few weeks once the simulations have completed. - Farren et al., Chemistry and Physics of Lipids, 34 (1984) 279-286 (https://doi.org/10.1016/0009-3084(84)90062-8): in this one they labeled C11 with 2H, and they could obtain results on DOPC, DOPE, DOPS, DOPG and DOPA ! Based on this and on the other results and discussion (http://nmrlipids.blogspot.fi/2017/07/quantifying-effect-of-bound-charge-on.html and https://github.com/NMRLipids/NMRlipidsIVotherHGs/issues/1), I think that we have to pay some attention also to the response of the headgroup order parameters to the lipid mixtures. Experimentally the PC headgroup order parameters in the mixed lipid bilayers follow the electrometer concept: neutral lipids have only a minor effect, while negatively charged lipids increase the order parameters. 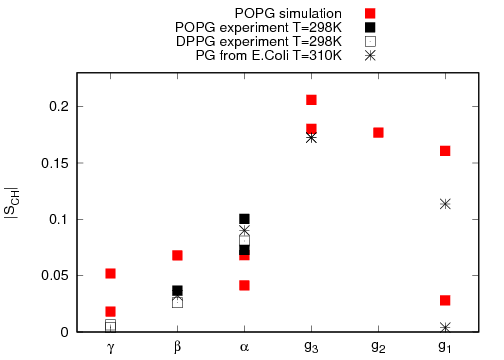 The Berger-OPLS simulations seems to overestimate the order parameter change due to the presense of PE, while CHARMM36 simulations seems to underestimate the change due to the negatively charged lipids. "PE membranes simulated with the typical Berger PE ff (so with just the methyl groups in the PC choline switched for standard hydrogen atom parameters) in general won't behave well. The hydrogens in the ethanolamine group form exceptionally long-lived hydrogen bonds with the phosphate oxygens generating ring-like structures in the head group. This is a general issue that also arises with PG and PS 'Berger' lipid parameters." Would you be aware of a reference where the presence of these conformations would be discussed? It would be easier to cite such work, rather than describe or plot the conformations in the manuscript. after some months of silence, I could come back to the PC/PE simulations. Amélie and I indeed observed what Thomas described, so the numbers I posted above come from these simulations, and may not be trusted. I'd be highly interested if there's a ref discussing this as well. If none exists I can generate the plots and post them (dihedral distrib + H-bonds). In between, we could do the simulations with the hack mentionned by Thomas (adding a repulsion on ethanolamine hydrogens), so we'll come back soon to post the results overhere. Last, a new student (Christos) working with me has launched some POPC/POPE simulations using the CHARMM 36 force field. We can post also these results if you think this is of interest (we can also re-launch some new simulations with DOPC/DOPE or POPC/DOPE to be consistent with the Berger compositions mentionned above and post only those new ones), let me know. "It should be noted that this area of 0.58 nm^2 for DPPE was achieved only after introducing a small repulsive interaction between the ammonium H atoms on the PE headgroup and any other atom, except the water H. Without this interaction, the area per headgroup for a DPPE bilayer at 343K was found to be 0.52 nm^2." So not explicitly discussing ring like structures in the head group but showing that without a repulsive potential on the hydrogens you get a lower APL. including a discussion of the extremely long-lived interactions in the head group with Berger based (i.e. Zhao and Elmore) PG force fields. and you can even see pictures of this happening in Figure 6 of that paper. That said, they do not discuss that this might be an issue with the force field. CHARMM36 simulations of PE in mixtures and pure bilayers are highly interesting. I think that POPC/POPE is the most interesting mixture since there is experimental data from that one (https://www.ncbi.nlm.nih.gov/pmc/articles/PMC553726/). Right now I do not think that it is necessary to run the DOPC/DOPE or POPC/DOPE mixtures with CHARMM36 for this project. I would be happy hear any comments of these from the point of view of these weird structures in Berger. The ring like structures are clearly visible in Fig. 6 in the last paper you mention. I think that we can cite it in the PS manuscript and write something like "The poor performance of headgroup order parameters in Berger model can be probably explained by ring like structures seen in Fig. 6 in Ref. http://www.cell.com/biophysj/fulltext/S0006-3495(04)74227-7"
"These ring like structures are a widespread feature of typical Berger based lipid force fields containing explicit hydrogen atoms in the head group [REFS https://pubs.acs.org/doi/abs/10.1021/jp900645z and https://www.sciencedirect.com/science/article/pii/S0300908408000692 and https://pubs.acs.org/doi/abs/10.1021/jp9110019]"
"Setting the LJ parameters to zero, which is the standard treatment for hydrogens, creates excessively stable, unphysical, bonds between the hydroxyl group and OA2/OB2 phosphate ester oxygens"
I have lots of pure PE bilayer simulations I will look out and share over the next few days. They are not in such a nice consistent way as the ones I have already shared for PS and may be for bilayers of different sizes, with different versions of GROMACS, etc. I'm pretty sure I should have some GROMOS-CKP, GROMOS43A1-S3, CHARMM36, CHARMM36-UA, Berger and OPLS-UA simulations (with and without LJ on the Hs for the last two). This is as long as I can find them amongst my older files. Most will be for POPE but there will also be some DPPE and DOPE (at least for CKP but maybe also some others). I will get back to you when I have found everything. Great, I'll post the CHARMM36 results on POPC/POPE (50/50) very soon. And you're right, POPC/POPE (50/50) is the most interesting regarding the comparison to experimental data. For the Berger simulations with the Marrink hack to avoid persistent H-bonds (BTW, how should we call these lipids? For this post I'll call them "PE Berger-hacked"), I will post the results on what we have so far (POPC[plain Berger]/DOPE[Berger-hacked] 50:50 and DOPC[plain Berger]/DOPE[Berger-hacked] 50:50). But I propose that Amélie and I launch another simulation of POPC[plain Berger]/POPE[Berger-hacked] (50/50) so that we'll be able to compare to CHARMM 36 and hopefully to experimental data (didn't go deeply into the experimental ref yet). It'll be also very interesting to compare to pure PE simulations from Thomas. So I'm back soon (before the end of the week) with all the results we generated so far! Finally, we have gathered and checked all simulations. First, here are the results with the plain Berger (P|D)OPC and Berger-hacked DOPE at a molar ratio 50:50. These simulations were generated and analyzed by Amélie Bacle and myself. Here are the results using CHARMM 36 POPC/POPE 50:50. For the reference, we also put some simulations of pure POPC (of course with CHARMM 36 also, and we find again very close values to the ones published in NMR_lipids_I). The simulations were generated and analyzed by Chris Papadopoulos and myself. Here are the results with the plain Berger POPC and "Berger-hacked" POPE at a molar ratio 50:50. These simulations were generated and analyzed by Amélie Bacle and myself. One can see that CHARMM 36 predicts a drop in the area on going from pure POPC to POPC/POPE 50:50. This means that POPC pack tightly to POPE. In contrast, the values for Berger are not that changed. The POPE value predicted by CHARMM 36 (in the mixture POPC/POPE 50:50) is much smaller than that predicted by Berger. I think it would be interesting to have values for pure POPE for both force fields. From what I read, the phase transition between the gel to the liquid-crystalline phase is 25°C (298 K), and the transition between lc and inverted hexagonal (H_II) is 71°C (344 K). So simulating pure POPE at 300 K should be OK.
@Thomas: You said you had performed such simulations, do you plan to share them here? Otherwise, let me know and we can generate them. - Shall we upload the trajectories to Zenodo? If yes, do we upload all of them or only POPC/POPE 50:50? - So far I didn't have time to compare all these values to experimental data, also I'm not clear whether we'll be able to extract easily S_CD values from the papers we spotted. Anyway, if there are plans for that, please let me know (I'll be very busy until May 21st). One question before more discussion. You wrote that the results reported September 2, 2017 at 6:29 PM for pure POPC (plain berger) are not correct. How about the results for POPC:DOPE and DOPC:DOPE mixtures reported on the same day? Are those correct? no there were mistakes as well on the results for POPC:DOPE and DOPC:DOPE mixtures posted on September 2 2017, please consider only the data posted on April 27 2018. Firstly, really sorry for the delay with this. Quite a few pure DPPE, POPE and DOPE 128 lipid bilayer simulations with two different head group charges (like the PS simulations). Also some other variants too with different charges. Also some POPE simulations of a 336 lipid hexagonal membrane. I can only find simulations with the vdW parameters included on the hydrogen atoms (for POPE and also DOPE I think, but I need to check these latter files to ensure they are what I think they are. Both of these were performed using a couple of different LJ parameters for the hydrogen atoms and were of standard 128 lipid bilayers). I definitely also did some "normal" Berger PE simulations but I cannot find them as yet. I can run some of these if needs be. POPE 128 bilayer simulations with and without vdW parameters on the hydrogen atoms (as in the Berger simulations). 336 POPE lipid hexagonal membrane simulations. I should also have some normal CHARMM36 POPE simulations somewhere too but I cannot locate them at the moment either. For all of the above simulations, there are two simulations using different starting velocities. Simulation lengths are typically 200 or 500 ns. DPPE simulations will have been performed at 342 K, DOPE at 271 K and POPE at either 303 or 313 K.
I'll get these all checked, analysed and uploaded to zenodo as soon as I can. If there are any that anyone would especially like first please let me know. Berger and GROMOS-CKP will follow later today. If anyone wants more GROMOS-CKP PE simulations with reaction-field or some different charges please let me know. Amélie will shortly upload the Berger simulations mentionned in my earlier posts. I finally started to compile PE data as well. Simultaneously, I also wanted to make the analysis process more automatic to handle the massive amount of data with less manual work. However, I realized now that most of this data is from united atom simulations. Previously in this project we have used the Gromacs protonate command to add the protons and then regular scripts to calculate the order parameters. This is, however, little bit annoying because protonate command does not work with the newer versions of Gromacs. Thomas has a recent publication and code to calculate order parameters also from united atom simulations (dx.doi.org/10.1021/acs.jctc.7b00643). However, also this one seems to require Gromacs 4 version (please correct if I am wrong). What do you think is the easiest way to calculate order parameters from united atom models nowadays? Can we do this somehow avoiding the installation of old gromacs versions or writing new code? What about reconstructing hydrogens with another software (e.g. openbabel)? I guess it should be doable to automatize the task like this. The change in beta order parameter of PC seems to be slightly overestimated in CHARMM when mixed with PE. I discussed the issue of reconstructing hydrogens to UA models with Jon Kapla, who implemented his own code to do this (quite) a while back. His motivation for writing his own code was to take into account the effect of the surrounding angles on the hydrogen location. I was thinking maybe his code is available somewhere, and maybe it could be useful for us. With his permission I am sharing his response below. I actually have the analysis code uploaded to GitHub, but it’s been some years since I last used it. If I remember correctly, the actual add hydrogen code is not that complicated, and should be possible to re-implement in e.g. Python (it’s fortran right now) quite easily (I guess). I think the code works, and I have memories of actually using it. The add hydrogen code seems to be left out of that one, but if I remember correctly the input is a ”define atom” as stated in the docs (where only center of mass is an option). Unfortunately I don’t think I have any example input files readily available. Thanks for the pointer Markus! That would be great indeed to have our own Python code for reconstructing hydrogens. Amélie and I can have a look in November whether we can convert Jon Kapla's routine to Python. Hi, thought I could show myself. I'm the guy with the github code Markus mentioned above. Samuli, I think this is basically the approach I've had in the fortran code (frame by frame reading and calculation). Add only the hydrogens you need on the fly, right before calling the order parameter (or whatever calculation) routine. Hi Jon, thanks for the message. I'll send you an e-mail off-list so that we are in contacts. @Samuli: sure we'll develop something which will be integrated within your existing code calcOrderParameters.py. While protonate isn't part of the newer versions of GROMACS, you could use pdb2gmx to achieve the same thing. As for the code in my work, yes it requires older GROMACS versions and doesn't work on the head group either. Have you used pdb2gmx for this purpose? I have not tried and by looking the help printout, it was not clear to me how this would work. According to the output, it would not read trajectories and I do not know how it would read the *hdb file. You are right that pdb2gmx doesn't work on trajectories but it will work on the individual frames (I've used this in the past to convert a united-atom bilayer to an all-atom one). The hdb file needs to be in the force field directory with a corresponding rtp entry. For a trajectory, a script employing trjconv -sep, multiple pdb2gmx and finally trjcat should do the trick. Experimental signs for POPS headgroup order parameters are now reported by Tiago Ferreira and added to the manuscript. In addition, I modified figures to include the sign information also for PE and PG from simulations. I also set the unknown signs for experimental data of PE and PG according the predictions from simulations. Simulations predict positive signs for alpha carbon for both PE and PG, which is in line with experimental data from PC and PS. However, simulations predict positive signs also for beta order parameters of PE and PG, which would be different than measured for PC and PS. It would be interesting to see from experiments if this prediction is correct. As Samuli suggested, I have uploaded the trajectories with scaled CaCl2 data for POPC and POPC/POPS Berger membranes from http://dx.doi.org/10.1038/srep38035. There are low (~100mM) and high (~700mM) salt concentrations included. We would still need the simulation only with counterions, i.e. POPC/POPS mixture without any added calcium, but having the charge from PS balanced by monovalent cations. In experiments this would be Sodium, but since Sodium overbinds in Berger simulations, it might be better to use Potassium. It would be also useful to run the simulations with Calcium in the presense of monovalent counterions balancing the charge of PS. This would correspond more closely to the experimental situation and we would also see how the presence of the counterions affects the Calcium binding. If you happen to have pure POPC and POPS simulations without any additional ions with the same temperature, those would be useful as well. These results are yet to be plotted to appropriate figure. As expected, the calcium binding seems to be overestimated. Also the changes of PS headgroup order parameters are overestimated and alpha response does not seem to be qualitatively correct. Further discussion will be done in the manuscript and more recent posts. Thanks for the data! I calculated the order parameters and updated the data into figures. However, the lowest concentration (100mM) seems pretty good. This requires some more attention. I am suspecting that this might be because of overbinding of counterions preventing Ca2+ binding, but it might be some other reason as well. Also, the concentrations for CHARMM simulations in this figure should be rechecked (discussion above). Simulations of pure POPC and POPS lipid with this model in the same temperature as this data (298K) would be highly useful as well to check the PS order parameters against experiments and the effect of PS to PC and vice versa. 2. There aren't any impropers to maintain planarity on either the carboxylate part of the headgroup or the double bond of the oleoyl tail. I've been meaning to have another look at this in further detail, correct the problems and setup some PS simulations but a million things have kept getting in the way. This is definitely something that needs looking at though. this is well spotted, and the POPS/OPPS mistake will likely affect the results. However, the lack of impropers in the tail will likely have no effect if the proper dihedrals have high enough barriers and start from the CIS conformation. This seems to be the case for my simulations, where the planarity is well maintained. OPPS will probably influence the results, but maybe not to a huge degree (https://pubs.acs.org/doi/abs/10.1021/jp902131b), although this should obviously be checked. As for the impropers, from just a very (very) quick visual look at the trajectories, the lack of planarity seems to impact more in the head group but I would need to do some proper analysis to be sure of this. Assuming that the improper is missing also in POPC, this also suggests that the effect in tail would not be critical. Especially g2 was significantly better in NMRlipids I. For POPC, there are impropers around the double bond. I'd have to double check to be sure but IIRC these were in part slightly strange as well. I think there was the typical improper across the C-C=C-C atoms but also another improper including one of the hydrogen atoms of the double bond too. Anyway, what I can definitely remember is POPS missed any impropers while POPC had them (this difference was what drew my attention to this in the first place). I'd be really surprised if simply getting the tails the wrong way around (i.e. just having something halfway down the tail different to how it should be) would change much in the glycerol order parameters. I guess the acid test is to switch the tails and run some POPS simulations. Is anyone doing these already? If not I can set some up, although we should decide what to do with the impropers too. Thanks for the information regarding MacRog POPC. Oleyl tail order parameters from MacRog OPPS would be quite easy to calculate using the scripts and data available via https://github.com/NMRLipids/MATCH/tree/master/Data/Lipid_Bilayers/POPS/T298K/MODEL_MACROG. I have not done it now because the focus of this project is in the headgroup and glycerol backbone. I think that the test of switching the tails to POPS would be useful and it would be great if you could do it. We have now quite a lot of data ran with this OPPS MacRog model. I think that we should not touch the impropers within the scope of this project. It is easiest to say that we used the files that developers share, observed these issues and checked if OPPS vs. POPS difference affects the glycerol backbone order parameters. Further testing of impropers can be left for future studies. Fair enough with regards to not looking at the tail. I will download the sims and do this myself. I will setup POPS simulations with the tails from OPPS switched around and everything else the same and run these asap. Shall I also run some simulations of the mixed PC/PS bilayers too? I think that pure POPS simulation would be sufficient, at least for now. If it gives some indication that our conclusions on mixtures or ion binding would change, then we can investigate more. Ok, good. I will setup the POPS simulations today. I have also been setting up some PS/PC mixtures for GROMOS-CKP. I will get these also running today. I'll upload the simulations to zenodo shortly. The difference is larger than I expected. Do you have the same counterions? Maybe there is some dependence on initial configuration, which may have been different between these simulations? Anyway, the main conclusion from both data sets would be that the model does not correctly reproduce the PS headgroup structure. Also, I do not think that changing the tail position would be critical for the response of PS headgroup to PC concentration or bound ions. Therefore, we might still consider proceeding only with OPPS simulations of mixtures and systems with ions. I'm re-running the analysis on more of the trajectories to see if that alleviates some of the differences between simulations with the different starting velocities. If not, I'll probably run some more repeats (I do also have some simulations with reaction-field that have already completed). Finally, I have also calculated the PC order parameters in these simulations too. If they are needed let me know and I will post them. Some values in "GROMOS-CKP Standard GROMOS HG v1" looks a bit strange, I will use only "GROMOS-CKP Standard GROMOS HG v2" for now. In order to organise the material, I have now divided the manuscript into two parts. The first one contains data for PS lipids (https://github.com/NMRLipids/NMRlipidsIVotherHGs/blob/master/Manuscript/manuscriptPS.pdf) and the other one for PE and PG lipids (https://github.com/NMRLipids/NMRlipidsIVotherHGs/blob/master/Manuscript/manuscriptPGPE.pdf). I think that we should progress these separately to make things more clear and easy. I will soon write a new blog post about this. I have started simulations of DOPS with Amber Lipid 17 force field; 128 DOPS lipids at 303K, following Tom's protocol. Na+ is the counter ion in the system, and I am running two replicates each using Amber ff99SB and Joung-Cheatham ions. It could be interesting to look at how ion parameters also effect to results. POPS at 298K simulations will also start shortly. Results will be ready in the early weeks of 2018. I have heard rumors about Amber Lipid17, but I have not seen any publication yet. I guess that the parameters are, however, available somewhere as you were able to start simulations? Do you know anything about the publication or other reports about Lipid17? Madej, B., Gould, I.R., Walker, R.C. A Parameterization of Cholesterol for Mixed Lipid Bilayer Simulation within the Amber Lipid14 Force Field. J. Phys. Chem. B. 2015.
where they added PS and cholesterol to Amber Lipid 14 forcefield and named the new FF as Amber Lipid 17. Gould, I.R., Skjevik A.A., Dickson, C.J., Madej, B.D., Walker, R.C., "Lipid17: A Comprehensive AMBER Force Field for the Simulation of Zwitterionic and Anionic Lipids", 2018, in prep." They contain the Amber topology file, Amber input file for the simulation parameters, four consecutive equilibration runs, and one production run, each of which 100ns long with 10ps sampling rate. I performed two replicates, and I uploaded all of them. Simulations are done using Amber16 engine with GPU's. I performed an initial analysis of the trajectories and calculated the head-group and glycerol backbone deuterium order parameters using AmberTools17. I am posting one output here to give you all an idea about how they look. Above are the values for DOPS at 303K, with ff99 ions. The order is: alpha, beta, g1, g2, and g3. First and third row are the order parameters for the given carbon, second and fourth columns are the standard deviations of the previous column, calculated over the trajectory. It looks like absolute values of the order-parameters match quite OK with the results from other forcefields. Only problem is with the sign; I'm not sure if there is a bug in AmberTools, or I did something wrong in the calculations. Anyway, I think I will be very good if someone can calculate the order parameters with their own scripts to cross-check. If needed, I can provide order parameters from all simulations. Thanks a lot for the data! The values in OrdParsDOPS.dat are exactly the same as from AmberTools17, but the signs are opposite. Thus, it seems that AmberTools gives -S_CH. This is common since traditionally the focus has been on the absolute values of acyl chain order parameters, which are negative. Based on these results, it seems that the Lipid17 model do not perform very well for the headgroup when the order parameter signs are taken into account. Raises a question - is the sign for beta right? Thanks for this as well. Which script did you exactly use for these? I think that we need to do something about the error estimates of these scripts. I think that the best way is to calculate order parameters separately for each lipid and then use the error of the mean, as done in NMRlipids I and II. so it seems that the sign of beta in Lipid17 is not correct and the results for alpha are also not very close to experiments. The corresponding trajectories for POPS (at 298K) with ff99 ions and with Joung–Cheatham ions are now also available on Zenodo. Also the area per lipid values would be useful. There are significant differences between different ion models, as JC-ions produce lower APL values. This also might be related why dihedral distributions look frozen. All the models, except CKP, give smaller area per molecule than the experimental value 62.7 A^2 (https://doi.org/10.1039/C4SM00066H). CKP values are in good agreement with experiment. Maybe this was used as a fitting parameter in parametrization? There has been suggestions in many simulation publications that the small areas in PS bilayers would arise from counterion binding and concomitant screening of the repulsion between headgroup charges. When looking at the data, I can see some correlations between binding affinity and area per molecule. However, the correlation does not seem very strong when comparing across the models. No, the APL wasn't used for any sort of parameter adjustment/refinement with GROMOS-CKP. In fact I just simply took the standard CKP model for most of the lipid and combined it with the typical GROMOS protein force field parameters for the PS head group (using two different schemes for the charges). 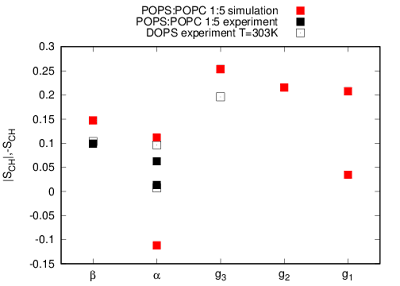 I have finished the simulations of POPS:POPC mixtures (1:5) using Amber Lipid17 forecfield at various KCl and NaCl concentrations (ff99 ion model used). All trajectories are 200ns long. Would it be possible to have also simulations of the same POPS:POPC mixtures (1:5) containing only counterions? We need these for the reference systems when looking the effect of added ions. Also simulations with CaCl2+conterions would be highly interesting. How are the reported concentrations calculated? The concentrations are calculated in the same way described in Matti's previous post (https://zenodo.org/record/1210256#.WuLs3S-B0Wo). My systems are the exact replicates of him, just with Lipid17 forcefield. I will start the simulations of POPS:POPC mixtures containing only counterions today. I'll post the data when they are ready. With CaCl2+counterions, I need to check the available ion parameters in Amber that would be suitable with Lipid17. I'll start those simulations next week most likely. I'm currently working with the supposed-to-become Lipid17 (or 18?) POPS, but within Gromacs. I have some results with PC-PS mixtures 5-1 at various salt concentrations. Once they are finished with a sufficient length, I'll happily share them. So far, the model looks quite promising despite the inaccuracies in the actual order parameters for pure POPS. However, I use different models for ions. Since I am not very familiar with the AMBER filetypes, I was not able to check this myself easily. Let me know if there is already some data for only counterion systems already available. I should also somehow find out the headgroup atom names of POPC in the AMBER files. As it is, the script we have won't be able to distinguish between different lipids with the same type of head group if we have a mixture of them. Other than that, in Amber all head groups, respective of the tail, have the same naming. I am working now on calculating the order parameters from all the simulations I have with Amber ff. At the moment, I have the simulations of POPC:POPS mixtures with NaCl, KCl, and CaCl2 counterions as well. I haven't uploaded them to Zenodo yet, but in few days I will. For the atom names in POPC and POPS, I will also upload a pdb file. I did some analysis already on the order parameters, see https://github.com/NMRLipids/MATCH/tree/master/Data/Lipid_Bilayers/POPS%2B83%25popc%2B500mMKCl/T298K/MODEL_LIPID17 and corresponding folders for other systems. When we have the system with counterions only, I will add the results into the manuscript. The pdb files would be useful indeed. I will also upload the order parameters, density profiles and dihedral distributions shortly. The figure could be more clear, but it seems to me that the changes of order parameters as a function of K+ or Na+ would be in rough agreement with experiments. Do you have simulations with different CaCl concentrations running/available? Those would be highly interesting as well. Sorry for the long silence. I personally have not done any simulations at different CaCl2 concentrations. I will start these simulations this week, and should get the results in next week. Simulations delivered by Pepa are now included in the manuscript (https://github.com/NMRLipids/NMRlipidsIVotherHGs/blob/master/Figs/CHANGESwithCaClPS-eps-converted-to.pdf). I will upload the order parameters and density profiles to GitHub when I obtain the results. Could you also deliver the ion density profiles of simulations with monovalent ions reported above? I've realized that the number of ions in Amber Lipid17 simulations, namely for KCl, NaCl, and CaCl2 at 500mm, 1000mm, 2000mm, 3000mm, and 4000mm concentrations is slightly larger than what it is supposed to be. It's due to an error I made when calculating the required number of ions. To be consistent with other simulations we have, I have fixed the number of ions, and rerunning these mentioned simulations. I apologize for this mistake. Hopefully in two weeks I'll get the correct trajectories, and upload the files to zenodo and github. I do not think that the concentrations have to be exactly the same in different models. Once you report the amount of monovalent ions in the current data (https://doi.org/10.5281/zenodo.1227256 and https://doi.org/10.5281/zenodo.1227271, I did not find the numbers of counterions anywhere and I did not know how to check it from Amber files), we can calculate and report the correct concentrations in the table II and in the plots. I believe that the conclusions are so clear that the small difference in concentrations between the models should not matter. Therefore, I think that the new simulations are probably not necessary.